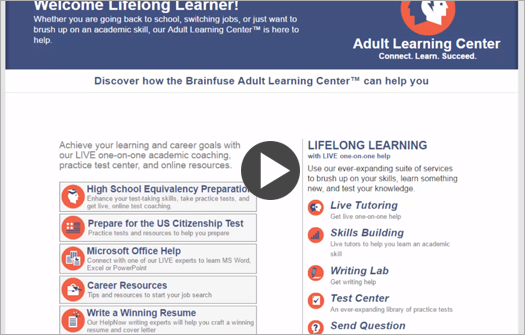 Adult learners who need help with a class assignment, or who need academic support for any other reason, can connect with a live tutor through our online classroom. Tutors are trained to not simply provide answers but to help users master underlying academic concepts. Brainfuse writing tutors strive to help users develop as writers. Their feedback is timely, personalized, and insightful. Live, Online Writing Support: Our experts provide live writing assistance to adult patrons in, among other things, producing more polished resumes, completing an academic assignment, or crafting an effective business letter. Live writing assistance is particularly helpful during the early stages of the writing process, when users need help organizing outlines and developing general themes. Intensive Writing Analysis: Users also have the option to submit their writing to us for more intensive analysis. Our writing experts provide users with instructive feedback (including suggestions for additional tutoring) within 24 hours. 24/7 access to important tests and test prep resources, including high school equivalency tests, the U.S. Citizenship Test, and skills assessments.